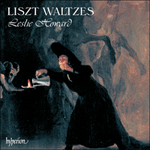 Twenty years separate the famous Mephisto Waltz No 1 from its companion pieces of the 1880s, but the work marks a point of transition to Liszt’s later style. Early critics were shocked by the daring harmonies, especially at the beginning where a devilish pile of fifths is assembled. The original title is Dance in the Village Inn, and refers specifically to a long passage (quoted in the score) from Nikolaus Lenau’s dramatic poem Faust. In the orchestral version the waltz is preceded by Der Nächtliche Zug (The Nocturnal Procession) and the whole work is called Two Episodes from Lenau’s ‘Faust’. Unlike the piano duet version, which is a straight forward transcription of the orchestral work, the solo version is really quite an independent piece. 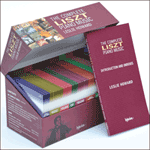 It is not known when Liszt wrote the two extra passages, but this was certainly a habit of his later years when, probably whilst teaching his music to aspiring pianists, he made a good many slight additions and alterations to the published versions—which, happily, may be consulted in the Neue Liszt-Ausgabe. The Mephisto Waltz No 1 (piano version) is dedicated to Karl Tausig; the Mephisto Waltz No 2, in both the concurrently written piano and orchestral versions, is dedicated to Camille Saint-Saëns. The second waltz begins, and dares to end, with the unresolved interval of a tritone—the familiar diabolus in musica, whilst the piece proper is, for all its spiky dissonance, firmly in E flat until the expected climax is shattered by the return of the B–F interval, and the piece ends unmistakably and disconcertingly on B, rather than in B! Anticipations of the harmonic world of Busoni, Skryabin or Bartók continue in the Mephisto Waltz No 3 (which, like its successor, exists only as a solo piano piece). Like its companions, it has the devil dancing a waltz where the groups of three move by so quickly that a larger rhythm of four is established, and indeed the third waltz abandons all reference to triple time in the dreamlike passage towards the end. Tonally, the piece is constantly pulled between F sharp major, D minor and D sharp minor. The reference to the Faust legend is maintained throughout all of the Mephisto music, but the seventy-year-old Liszt’s Mephistopheles is a grimmer, more unrelenting figure than that of the Faust Symphony or the Mephisto Waltz No 1. The Bagatelle sans tonalité (what a title, in 1885!) and the Mephisto Waltz No 4 remained unpublished for eighty years. It’s not certain exactly when the Bagatelle was written, but since it bears (confusingly) the title of Fourth Mephisto Waltz it must postdate the Third. Whilst the piece is not especially dissonant, it is certainly very wayward in any kind of feeling for a tonal centre and ends with an upward-rushing set of diminished sevenths. The piece for which the title Mephisto Waltz No 4 is nowadays exclusively reserved resembles the second in its possession of an introduction and coda which defy the basic key. Here the piece is in D, but begins and ends on C sharp. This similarity was an encouragement, when completing the sketches for the contrasting section, to refer to the main material during the Andantino, and to recapitulate a portion of the Allegro before Liszt’s coda.